Availability: This guitar is currently in a production run and estimated to arrive into stock between June and July 2019. 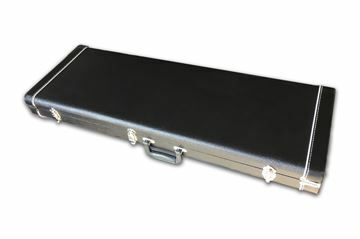 Protect your guitar with a G&G Quality Hard Shell Case, custom made for PHRED instruments guitars. Case dimensions are approximately 42"x15"x4". Re-wire the entire guitar with vintage cloth wiring, CTS pots, Orange Drop Capacitor, Switchcraft output jacks, and a CRL 5-way pickup lever switch. In addition to upgrading your tone, you'll get smoother turning knobs and a more fluid pickup toggle selector. Choose from the following options when rewiring the electronics. Replace the stock bone nut with a brass nut to enhance the guitar's natural sustain and brightness. Replaces the stock pickups with DiMarzio or Seymour Duncan Pickups, with 4-conductor wiring, black color (other colors and covers may be requested for additional charge). Shield the Guitar Pickup Cavity Route with Copper Foil Tape. Replaces the standard stock tuning machine heads with Schaller M6, 3 per side, gold color tuning machine heads. Choose to replace the stock pickup mounting ring, 5-way pickup toggle, output jacks, and truss rod cover with solid brass mounting plates. 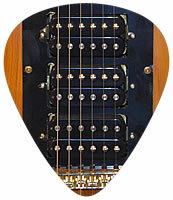 Replace the stock tune-o-matic bridge with one of the following options. Choose between the standard stopbar tailpiece or our custom made pH Tailpiece, available in brass or chrome plated aluminum. The stickers will be affixed to the guitar prior to shipping unless otherwise requested. Stickers are created by inlaystickers.com. Add a Junction Box to connect the OBEL on the guitar to your FX chain. Add a Dual TRS/TS Cable to connect your OBEL Equipped guitar to an OBEL Junction Box. Add a few extra feet to your Dual TRS/TS Cable. Switch to Right Angle Plugs on the other side of the Dual TRS/TS Cable, such that both ends will have Right Angle plugs. Please add any additional notes in the text area below. The contoured body features a triple humbucker setup mounted in a custom pickup plate, with discrete split coil switches and a 5-way pickup toggle for 14 different tone combinations! There is one master volume and 2 tone knobs, allowing you to dial in tone that goes from dark and muddy to crisp and bright. There are two 1/4" output jacks on the top of the body. One of them is a standard guitar output to plug in a standard guitar cable. The other output is used for the built-in on board effects loop (OBEL), allowing you to gain further control of the sound coming from your effects pedals. Scroll down below to read up on the benefits of having an OBEL equipped guitar. On the back of the guitar, there is a large and accessible electronics cavity and a 9V battery box that powers the internal built-in preamp. The built-in pre-amp boosts the signal a small amount and lowers the output resistance so that the signal is better preserved along the guitar cable to your amp. We offer an optional custom hard shell case to go with the Liger guitar. The maple core neck is attached to the body using very strong wood glue. The back of the neck contour is a C-shape that feels somewhere in between a strat and an LP neck, not too thin, and not too chunky either. The 2-octave ebony fingerboard has 24 medium jumbo frets which are leveled and milled here at our shop in California for a nice smooth feel along the edge of the fretboard. 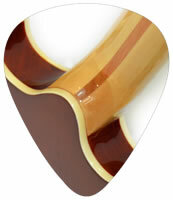 The fretboard features a 12 degree radius which is perfect for soloing and playing chords up and down the fretboard. Topping off the fretboard are custom pearloid inlays which are inspired by Doug Irwin's Tiger guitar fingerboard inlays. At the top of the neck, you'll find a bone nut for good sustain, and white binding all around the fingerboard for a clean look and feel. The tilt-back 3+3 headstock shape features colorful pearloid binding. Under the fretboard is the adjustable double-expanding truss rod, keeping the neck stable in any climate. Overall, well worth the price. Nice action. Lower than my Ibanez Artist and that feels like butter. Good intonation. Beautiful headstock even before the decal was added. Wonderful fretboard with smooth inlay. Ebony isn't expected at this price point. Nice upgrade to a bone nut over plastic BTW. Lightweight overall and a back saver. Big strap pegs, negating the need to install the gold schaller locks I bought for it in advance. Warm sound but still crisp with bridge pickup on. Clean, knot free mahogany. Nice high gloss finish. Quite electronics (no hum, no scratchy pots). Overall, well worth the price. I was very happy knowing I may not need to change a thing. From a 10 minute play on it I was impressed overall the stock tuning keys which seem to keep in tune and I am sure the pickups will sound good plugged in. So I was very happy knowing I may not need to change a thing on it to use it for gigs as is. Also the fit and finish is very good. It arrived without any scratches rubs or finish issues at all. Now i just need to crank it up live for a real testdrive. It sounds great, plays fantastically and looks like a million bucks. I have had my Liger for a while now and I want to thank you for making such a great guitar. It sounds great, plays fantastically and looks like a million bucks. Keep up the good work and thanks again. A Wolph may be in my future!! Whoever does the setup did a fantastic job. Got my Liger yesterday, and I love it. Whoever does the setup did a fantastic job, please convey my appreciation. I'm looking forward to see what the Deadbolt is like. Thank you, thank you, thank you! Got the OBEL up and running after re-wiring my pedal tray. Sounds awesome. Effects never sounded better, guitar is easy to play for a new instrument and very varied in terms of tones I can get. Really happy so far, thanks. After just two weeks, feels like I have been playing this forever. I am blown away. After just two weeks, feels like I have been playing this forever. The sounds I have always searched for in my pedal effects are finally what I always wanted them to be. Years of tone frustration just washing away. I have a close friend who works in guitar retail, used to be in charge of vintage instruments for a major national chain in the NYC branch. He was amazed at how good the Liger feels and sounds un-amplified. He asked if paid $2,000 like it would have been a good deal at that price. I have been fiddling with the pickup configuration switches and tone controls today, possibly too many subtle differences for right now, the middle pickup seems dominant, and the OBEL loop works as advertised. Fit and finish is quite nice, all frets are dressed, and I didn't get any buzzing on strings when I tuned down one step flat. This is the best guitar that I have owned. I waited until Tuesday morning to tune her up, and played scales for several hours; this morning the top two strings were a little flat, but that is not bad for new strings. I have been fiddling with the pickup configuration switches and tone controls today, possibly too many subtle differences for right now, the middle pickup seems dominant, and the OBEL loop works as advertised. Fit and finish is quite nice, all frets are dressed, and I didn't get any buzzing on strings when I tuned down one step flat. Going to keep experimenting. This is the best guitar that I have owned. Thanks again for an amazing instrument. I just wanted to drop a line to say that the new Liger is a work of art!!! The set up is great, the fret action fantastic, and has just the attitude I was hoping for in the playing. It was worth all the waiting!!! Thanks again for an amazing instrument. You have a good product with good support and word got around. My guitar arrived and it looks beautiful!! I'm so excited. I'll be getting to know it tonight! Many thanks! Got the Liger today. Totally worth the wait! Whoever is doing the fret work, give 'em a raise. Plays like butter. I could not put it down for days. I ordered this guitar essentially as a vanity piece. Loving the music of Jerry and the Grateful Dead I wanted something inspiring to look at and play when I was playing that music or had Jer in mind. I had seen positive reviews online in terms of playability and build so I thought it would be about on level with an Ibanez Artcore or similar Chinese import guitar (...which of course it is.) However, when the guitar arrived I was totally floored. I could not put it down for days. There were some minor finish irregularities as Fred had clearly shown and described. But the setup was so amazing, and the playability was so right on. The basic ingredients of a guitar like this are all there; The 25.5 in scale, the ebony fretboard. The high mass in the body and headstock. The neck joint, which is totally solid. All this got me much closer to the actual Jerry guitar sounds than I expected. So clear and with real pop if you dig in. (I got the Swamp Ash body option) And a very consistent sound and volume up and down the 24 frets, with lots of natural sustain. No dead spots. Not only that, so far I love the pickups. And the pots, switches and hardware are all totally solid. I'm not making any mods or changes for a while. I know I can't say this will be true of all of them, but for me this is a guitar that just sings. It's more than the sum of it's parts. I've spent a lot more on guitars that should have been better, but just didn't have ""IT."" For me this guitar has ""IT"" in spades. I'm not trying to say Jerry would come back from the dead and pick this guitar over Rosebud. But this is a dang good guitar in it's own right I personally like mine a LOT. Also importantly Fred is totally chill to do business with. No funny business, hidden costs or other weirdness. Which is easy to forget when it's not there. So I don't know how you did it, Fred but keep doing it! The ebony fretboard is amazing. I'm not sure how to articulate just how impressed I am with my Liger. I am absolutely blown away by the value. The tone is phenomenal - I opted for the brass nut and a Super 2 in the middle position, but the stock pickups sound good as well. I have recently been playing a Strat into a Fender Twin which has allowed me to approximate a pretty decent Jerry tone, but plugging the Liger into my rig - without changing anything - brings me significantly closer, it's crazy. The ebony fretboard is amazing, the neck feels great, the guitar is heavy, solid, and balanced. Very impressed with the natural sustain and the tech who set it up is a straight up luthier, a pro - and it comes through. It's also gorgeous. The sculpted body is gorgeous. The stain is beautiful, with the wood grain really coming through. A weird comparison, but when you see someone that you thought was attractive in a picture anyways, but then you see them in person and they are even better looking? It's sort of like that. If you're on the fence go for it. I can't think of many other opportunities to get as good of a deal. It's a no brainer. Hats off to Freddy and his team for doing what I thought could never be done. It has a wonderful feel, action, and tone! I just got my Liger delivered! What a beautiful guitar! I tuned it and played it for several minutes (in my office!) and can’t wait to plug in later! It has a wonderful feel, action, and tone! Thank you very much, I have a feeling I will be looking for a Deadbolt and/or Wolph soon! I play without an amp often and every note rings like a bell. This guitar is amazing. It has everything needed and it's controllable. I love the ergonomics and the neck is killer. It's as good as any guitar considering electronics can be changed to personalize ones preferences. I play without an amp often and every note rings like a bell. It's lively and even. This thing has soul and it's something lacking in a big part now even in the 10k guitars. I received my Liger and I Love it! The neck and headstock are among the prettiest I've ever seen, she is a beauty! She is heavy and has great sustain, sounds great even when playing it acoustically. I received my Liger about a week ago, and I haven’t put it down since. Plays like butter, sounds incredible, and so versatile. Everyone who has played the guitar since i recieved it has had nothing but great things to say about it. This instrument is just fantastic. Huge thank you to the Phred instruments team, great guitars, and outstanding customer survive. I think I see a Wolph in my future. To ensure that we deliver high quality playability and tone, one of our master guitar techs in the Los Angeles area meticulously inspects your guitar from headstock to the bottom strap button, and performs a setup to make your PHRED guitar feel comfortable to play. 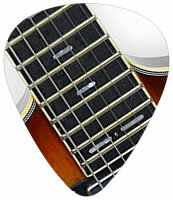 You can look forward to smooth level frets without any sharp edges, low string action, and adjusted intonation. If you have a specific request for your guitar setup, just let us know. All upgrade options are installed by our techs in Los Angeles while your guitar is getting a setup. Purchase a PHRED guitar with peace of mind. We believe the best way to try out a PHRED guitar is to play one in your own home with your amp and your effects pedals. 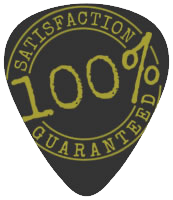 To make that possible for you, your PHRED guitar includes a 21-day money back guarantee. It's really simple. If you are not happy with your PHRED guitar within 21 days from the date of delivery, you may return your guitar for a full refund (see below). We do custom builds for left handed guitar players. In the Additional Notes text area above, just type in that you would like this guitar made left-handed. There is no additional charge for left handed Phred guitars, but expect a 4-6 month build time. If you live inside the continental USA, your guitar will ship via UPS Ground. If you live in Hawaii, your guitar will likely ship UPS 3 day. If you live outside of the USA, your guitar will likely ship via the United States Post Office. You may request FedEx shipping if you prefer FedEx delivery. All guitars ship with a tracking number which will be emailed to you at the time of shipping. You will receive one email from PHRED instruments and possibly a second or third email from the shipping company and/or the place from which you purchased if it was other than the PHRED instruments website. Shipping charges are calculated at checkout for international shipping. If you live outside the USA, there may be additional import charges added at the time you receive your guitar. These charges are unknown to PHRED instruments, LLC, and will not be reimbursed by PHRED instruments, LLC. PHRED instruments guitars are placed inside a foam sleeve which is placed inside a corrugated guitar box with Styrofoam support for the guitar neck and bubble wrap around the bottom, top and sides of the guitar. The guitar box is sealed with clear tape and then wrapped with a second layer of corrugated cardboard and sealed with clear tape to add stability and strength to the shipping box. PHRED instruments guitars are placed inside the hardshell case, the hardshell case is placed inside a plastic sleeve, and then placed inside a shipping box with cardboard end pieces, providing a protective air gap. We truly want you to be happy with your guitar purchase, but if you decide you'd like to return the guitar for any reason, please read below and contact us to initiate a return request. Note: A full refund is the price you paid for your guitar plus the price you paid for shipping. Returns shipped from within the continental USA will be provided a pre-paid UPS ground shipping label upon request. If your guitar was shipped to a location outside of the continental USA or if you would like to return your guitar after 21 days from delivery but within 30 days from the date of delivery, you may return your guitar for a refund of the price you paid for the guitar. 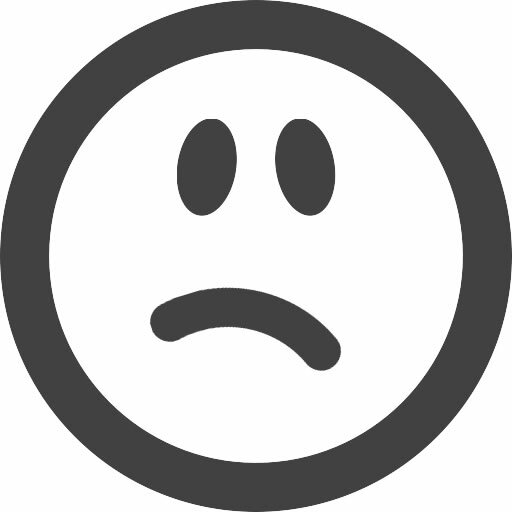 Shipping charges will not be refunded and you will be responsible for the shipping charges to return the guitar. While it is extremely rare, there is a plan in place just in case things go wrong with the delivery. If your shipping box arrives with damage to the box (holes, tears, cuts, etc. ), please take pictures of the box and email those photos to us. If possible, please also contact UPS (1-800-PICK-UPS) immediately to report it. If the guitar arrives with damage as well, please contact us immediately to arrange for a return request. We will need to setup a damage claim request with UPS and either tell UPS to pickup the package from your location, or have you return the package back to us. This guitar is equipped with an On Board Effects Loop (OBEL). What does OBEL stand for? OBEL stands for On-Board Effects Loop. 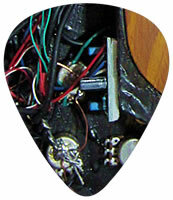 It is a wiring design inside the guitar which uses a separate 1/4" stereo jack to allow the direct output from the pickups to go to effects pedals and then back into the guitar for post-effects volume control. The purpose of the OBEL is to allow for volume adjustments on the guitar after being processed by effects. You may notice that distortion and envelope filters respond differently with volume adjustments on a standard electric guitar. Using an OBEL allows for consistent response from your effects pedals/processors at any guitar volume. Below is an example showing the PHRED instruments Wolph guitar connected to an amp and effects chain with the OBEL. In this example, the Wolph guitar has a mono guitar cable plugged directly into the guitar amp. The other guitar cable is a stereo 1/4" guitar cable that plugs into a Hard Truckers Junction Box (SP-1 'Y' Junction Box), other junction boxes will work as well. At the send of the junction box, one mono guitar patch cable plugs into the input of the first effect in the pedal chain (Mutron III). The effects chain uses standard guitar patch cables to connect each effect. The output of the last effects pedal connects to the return of the junction box. The OBEL bypass mini-toggle is used to either bypass or use the effects loop. What is required to use the OBEL? We recommend to use a junction box with a stereo 1/4" guitar cable to connect the guitar to a junction box (a stereo Y-cable can be used instead). A junction box looks like an effects pedal. It has a 1/4" stereo input jack on one side, which is where the stereo guitar cable from the guitar's OBEL jack plugs into. The other side of the junction box has 2 mono 1/4" jacks. One of those jacks is a send to the input of your effects the other is a return from the output of your effects. Using one mono guitar fx patch cable, connect the send from the junction box into the input of your first effect pedal, and the the return from the junction box plugs into the output of your last effects pedal in the chain. Can an OBEL equipped guitar be plugged in like a standard electric guitar with one cable using just the mono guitar output? Yes, you do not have to use the OBEL in order to plug in your guitar to your effects. You can simply bypass the OBEL using the OBEL bypass mini-toggle switch on the guitar and use the guitar as a standard electric guitar with your effect pedals plugged in-line between your guitar and amp. Where can I get a junction box? PHRED instruments recommends The HubBub junction box by Godfrey Daniels Guitar Works which has more functionality designed for guitar players who play guitars with standard mono guitar outputs and also with OBEL equipped guitars. Click here to view Junction Boxes in our OBEL Accessories section. Where can I find a stereo guitar cable? We recommend the Dual TRS/TS Cable by Godfrey Daniels Guitar Works. Click here to view Cables in our OBEL Accessories section. This guitar is temporarily sold out! PHRED instruments guitars are built in small batches. Almost every guitar in production is spoken for by the time they arrive in stock. How long does it take for a production run to be completed? Usually it takes anywhere from 2-6 months for a production run to be complete. What determines that time frame is usually the total amount of guitars in the production run, time to source materials, hardware and electronics, and unexpected delays. Contact us to learn more about our production schedule. Reserve your guitar from the next batch by pre-ordering today! By pre-ordering this guitar, your pre-order is placed into our queue system explained below. When your guitar arrives in stock, we will setup and install any options you selected, and then we'll ship out your guitar. Pre-orders are processed in the order in which they were received. When your order is in the pre-order queue, it means that your guitar is currently in production or waiting to begin production. When your order is queued, it means that your guitar has come in to stock and is now waiting to be pulled from the shelf to go for a setup. When your order is in the setup queue, it means that your guitar has been pulled from the shelf and is with a guitar tech waiting to be setup. When your order is in the shipping queue, it means that your guitar is waiting to be boxed up and shipped out. Guitars are typically boxed up and shipped out on Monday or Friday and tracking information will be emailed to you when your guitar ships out. 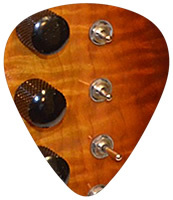 Look for these 5 features on many PHRED instruments guitars. While most electric guitars have only 22 frets, PHRED instruments guitars give you an extra two frets on the fretboard, providing a full 2 octaves on each string. We believe that 24 frets helps you more easily locate your position when playing above the 12th fret and provide better access to the higher frets when soloing. A set neck is glued in rather than screwed in to the guitar body. As a result, a set neck will transfer more of the string vibrations to the guitar body, producing a more warm and resonant tone with more girth and sustain. While many guitars have just 1 or 2 pickups, we believe that a 3 humbucker setup opens up the pallet to guitar tones you might otherwise never get the chance to play. Almost all of our guitars feature a triple humbucker setup with split-coil switches, however, we also recognize the unique tone of playing with true single coils and so we offer them as well on some of our guitars. If a guitar has a humbucker pickup, we believe that it should also have split-coil mini-toggle switch. Splitting the coils on a humbucker reveals a single-coil pickup tone, allowing you to get two tones from one pickup at the flick of a switch. Split-coil toggles are found on almost all of our guitars that have humbuckers. Behind the scenes, a built-in preamp (unity gain buffer) maintains and improves the tone of the guitar pickups as the sound travels along the guitar cable to fx pedals and amplifier. All of our guitars that have an On Board Effects Loop (OBEL) also have a built-in preamp. The PHRED instruments Wolph gets its inspiration from Doug Irwin's Wolf guitar, one of the iconic guitars played by Jerry Garcia. The body features a single-humbucker-humbucker setup mounted in a custom pickup plate, with discrete split coil switches and a 5-way pickup toggle for 12 different tone combinations! Our Wolph is professionally setup with low action and D'Addario 10-46 strings, and the frets are leveled and milled here at our shop in California for a nice smooth and clean feel all around. 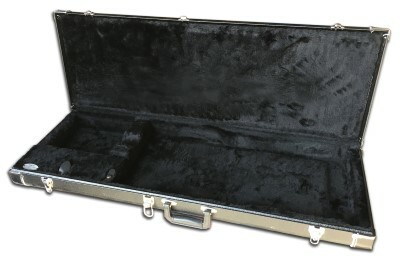 Our custom hard shell case is made in the USA by G & G Quality Case Company for PHRED instruments. Cases are custom made to match the guitar you order. Please allow 1-3 weeks for case to ship. The PHRED instruments DockStar Spalted Maple is a full hollow body featuring a dual humbucker setup, with discrete split coil switches and a 3-way pickup toggle for 8 different tone combinations! Every DockStar Spalted Maple is professionally setup with low action and D'Addario 10-46 strings, and the frets are leveled and milled here at our shop in California for a nice smooth and clean feel all around. Michael Morrow is an award winning Grateful guitarist and vocalist who has been touring the US since 1990s. Michael has had a storied yet gradual rise to notoriety, in a career that began from his early Jersey shore barroom rock, to the far corners of the musical Universe. PHRED instruments is excited to announce our Show Opener contest where you have a chance to win up to $300 toward a PHRED instruments guitar by guessing the first song played by a band during a live performance.